The use of the term “sweepstakes” is for marketing purposes only. In actuality, this is a “Drawing of Chance” under Florida Law, governed by 2009 Florida Statutes - Title XLVI Section 849.0935. Consumer Disclosure: The sweepstakes are being conducted by the Maltz Jupiter Theatre, a not-for-profit 501(C)(3) organization with its principal place of business located at 1001 E. Indiantown Road, Jupiter, Florida 33477. This is a “drawing of chance” whereby entrants are entered into a drawing to win the one grand prize. There is no cost to enter the sweepstakes. There is no limit on the number of total entries that will be accepted except as follows: (1) Receive entry form for each subscription; (2) No entries will be accepted after 12:00 pm, Sunday, April 9, 2018. The odds of winning are based on the number of entries (subscriptions) received for the drawing. Only the person or couple whose name appears on the official 2018/19 subscription form will be automatically entered into the drawing and receive an entry form(s). The drawing will be conducted as scheduled even if fewer than two (2) entries are received. The contest begins at 10:00 a.m. EST on January 23, 2018 and ends at 12:00 p.m. EST on Sunday, April 8, 2018. All proceeds benefit the Maltz Jupiter Theatre. The funds used to purchase the prize, if any, shall come from the general operating fund of the Maltz Jupiter Theatre. No purchase or renewal of a subscription for the Maltz Jupiter Theatre 2017/2018 season is required to enter into the drawing. If you would like a ballot, please mail a request to the Marketing Department/Taste of the Town 1001 E Indiantown RD, Jupiter FL 33460. Restrictions apply. ONE (1) GRAND PRIZE WILL BE AWARDED. ELIGIBILITY: Void where prohibited. Limited to U.S. residents only. Employees of the Maltz Jupiter Theatre and their immediate family members are ineligible. Individuals under the age of 18 are ineligible. HOW TO ENTER: Maltz Jupiter Theatre subscription order forms, subscription renewal forms, and official sweepstakes entry forms are available for pick-up at the Maltz Jupiter Theatre box office. Agents of the Maltz Jupiter Theatre may mail out or distribute through other means subscription order forms or subscription renewal forms or official sweepstakes entry forms. Agents of the Maltz Jupiter Theatre may hand out or distribute through other means subscription order forms or subscription renewal forms or official sweepstakes entry forms at public or private events. There will be a Marketing table during the last week of the Hairspray (January 23 through January 28). Provided that you submit a completed new subscription order form or subscription renewal form as described above on or before 12:00 pm, Sunday, April 8, 2018, you will automatically be entered into the drawing. SELECTION AND NOTIFICATION OF WINNERS: The drawing is open to the public. The winner will be announced immediately Monday, April 9, 2018 and the prize will be awarded. Once submitted, entries become the sole property of the Maltz Jupiter Theatre and will not be returned or refunded. If the prize is not claimed by Friday, April 20, 2018, we will conduct a raffle to include all entries and a drawing will be held on Monday, April 23, 2018. If a potential winner cannot be reached after ten (10) days from the first notification attempt, or if an entrant is found to be ineligible, or a prize notification is returned as undeliverable, such prize will be forfeited and an alternate winner will be selected by random drawing. The prize shall be delivered at no expense to the winner. PRIZE: There will be one prize winner. The prize is being given away in “as-is” condition. Each prize is non-exchangeable, non-transferrable, non-refundable, and has a cash value of $0.01. The prize shall be delivered at no expense to the winner. The Maltz Jupiter Theatre does not guarantee the actual value of the prize. The Maltz Jupiter Theatre reserves the right to substitute a different prize in the event that the prize awarded cannot be fulfilled as described. GENERAL: By entering the contest, participants agree that the Maltz Jupiter Theatre, its board, guild, directors, staff, volunteers, contractors and agents have no liability whatsoever for any injuries, losses, or damages of any kind which result from participation in the sweepstakes. The prize(s) must be accepted within ten (10) days from the date of award Monday, April 9, 2018, or it will be forfeited and an alternate winner will be selected by random drawing. The prize(s) cannot be exchanged for cash. No substitution, assignment or transfer of a prize is permitted. Except where prohibited, the Maltz Jupiter Theatre may use any winner’s name and likenesses in any media for publicity purposes without further compensation. 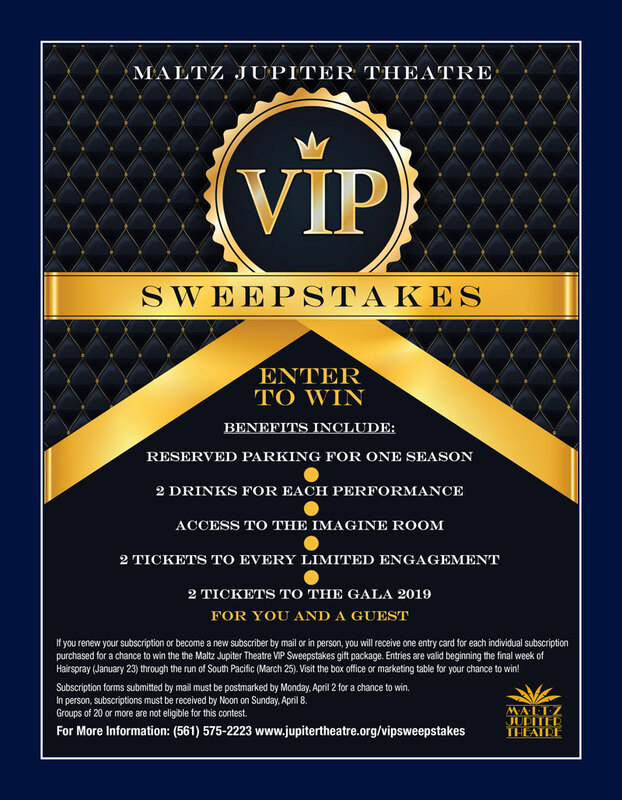 RESTRICTIONS: By participating in the Maltz Jupiter Theatre 2018/19 Season “Maltz Jupiter Theatre VIP” Sweepstakes, a participant agrees to be bound by these Official Rules, and by all decisions of the sweepstakes judges. DISPUTES: Entrant agrees that (1) any and all disputes, claims, and causes of action arising out or connected with this sweepstakes, or any Prize awarded, other than the administration of the contest or the determination of the winner, shall be resolved individually, without resort to any form of class action, and exclusively by the appropriate Florida State Court located in Palm Beach County, Florida; (2) any and all claims, judgments and awards shall be limited to actual out of pocket costs incurred, including costs associated with entering this contest but in no event attorneys’ fees; and (3) under no circumstances will entrant be permitted to obtain awards for, and entrant hereby waives all rights to claim punitive, incidental and consequential damages and/or any other damages, other than for actual out-of-pocket expenses, and any and all rights to have damages multiplied or otherwise increased. SOME JURISDICTIONS DO NOT ALLOW THE LIMITATION OR EXCLUSION OF LIABILITY FOR INCIDENTAL OR CONSEQUENTIAL DAMAGES, SO THE ABOVE MAY NOT APPLY TO YOU. All issues and questions concerning the construction, validity, interpretation and enforceability of these Official Rules, or the rights and obligations of entrant or the Maltz Jupiter Theatre shall be governed by, and construed in accordance with, the laws of the State of Florida, without giving effect to any choice of law or conflict of law rules or provisions (whether of the State of Florida, or any other jurisdiction), which would cause the application of the laws of any jurisdiction other than the State of Florida. All federal, Florida, provincial and local laws apply. WINNER LIST/OFFICIAL RULES: For the name, city and state of prize winners and a set of Official Rules, send a self-addressed, stamped envelope to Maltz Jupiter Theatre, 1001 East Indiantown Road, Jupiter, Florida 33477. Requests must be made by April 9, 2018. DRAWING DATE, TIME AND LOCATION: The drawing will be held at Monday, April 9, 2018 at 5:00pm in the Maltz Jupiter Theatre main lobby at Maltz Jupiter Theatre, 1001 E. Indiantown Road, Jupiter, Florida 33477, the drawing is open to the public. For further information, please call the Maltz Jupiter Theatre at (561) 575-2223, 1001 East Indiantown Road, Jupiter, Florida 33477.